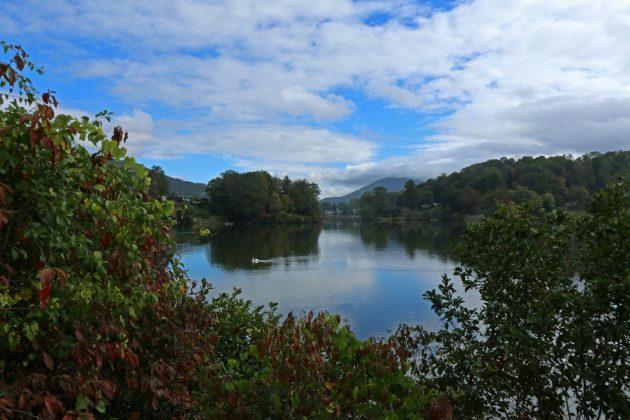 Lake Junaluska is surrounded by mountains, beautifully situated in scenic Western North Carolina, near the famous Blue Ridge Parkway and Great Smoky Mountains National Park. My friend Elisa and I hit the walking trail in early October, taking in the beginning of the autumn foliage and fall flowers (her) and any available avian species (me). We walked just over two miles, first along the road, then on the edge of a few quiet neighborhoods before looping back on a picturesque footbridge over the water. View of a swimming Mute Swan. Elisa and I had been college roommates, meeting the very first day of classes back in 2008. We had stayed close since graduation, regularly visiting each other at her home-base in New York City and mine in Washington, DC, then North Carolina, and now Florida. She knew I loved to visit Central Park when I stopped into the city, but until our long weekend in North Carolina I had never actively birded in her presence before. Birding in front of someone new is always a little nerve-wracking: Will she think I’m weird? Will she be annoyed at my slower pace? Luckily for me, Elisa was perfectly happy to take photos as I paused to identify birds, and she was supportive of my attempts to birdwatch throughout the trip. Score one for the bird enthusiasts! The most obvious birds dotted the lake like feathered buoys, lazily swimming back and forth or actively diving for food along the aquatic bottom. Mute Swans shown in bright white plumage, contrasting with the deep blue-green of the water’s surface. Mallards appeared frequently along the brushy edge, while Pied-billed Grebes and American Coots spun in circles. Songbirds were few and far between at first: a pair of Northern Mockingbirds and a few Blue Jays flying overhead as we continued to walk at a leisurely pace. The pedestrian bridge stretches between two woodland patches, and as we approached I heard an explosion of birdsong. White-breasted Nuthatches spiraled around the branches, Carolina Chickadees buzzed back and forth to each other before alighting across the lake, and an Eastern Phoebe bobbed its tail while singing in nasal tones. The flood of calls ended just as suddenly as it began, the mixed flock moving in feathered crowds around the lake. Birding can take many forms. Spotting our favorite species can be exhilarating, active, soggy, exhausting, stressful, and so much more. 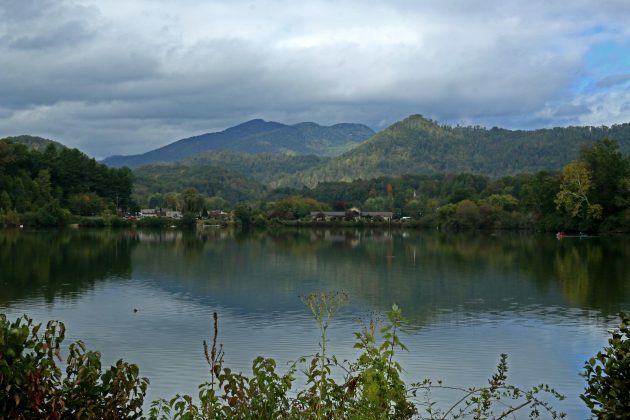 But, as my saunter around Lake Junaluska demonstrated, birding can also be relaxing, and closing my eyes to remember the serene mountain reflections will surely bring me to my happy place.